Black slate is GE's answer to the black stainless trend. Black slate is a deep charcoal color with a unique matte finish that helps to hide fingerprints and minimize smudging for a beautiful clean look. It has a subtle gloss that offers a softer glowing alternative to stainless steel and black stainless. GE is one of the most innovative appliance manufacturers. They introduced slate several years ago throughout their lineup and the color has been very popular because it is unique in the marketplace - you can read more about it in our article on slate vs stainless steel appliances. Stainless steel has been the big trend for over a decade with every manufacturer offering virtually the same finish. GE, like other brands, has offered stainless steel but has been a trailblazer in offering slate. Now that the trend is heading toward black stainless steel, they have decided to pioneer black slate. 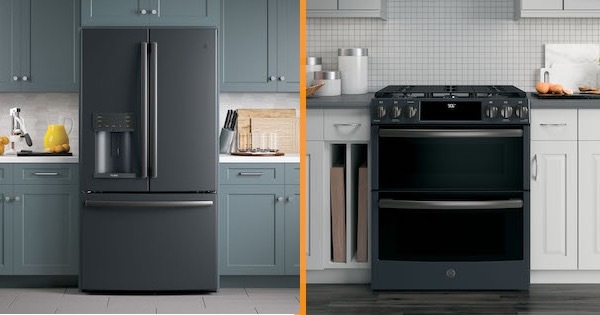 Black slate was initially only available in GE's restaurant-inspired Cafe line, but it is now also available in their main GE Appliances line and GE Profile as well. GE Cafe offers the option of contrasting stainless steel bar handles or even customizable hardware, while the Profile and main line offer matching curved handles. In their Cafe line, black slate is being rebranded as black matte for their new Matte Collection (read more about the Matte Collection in our article). 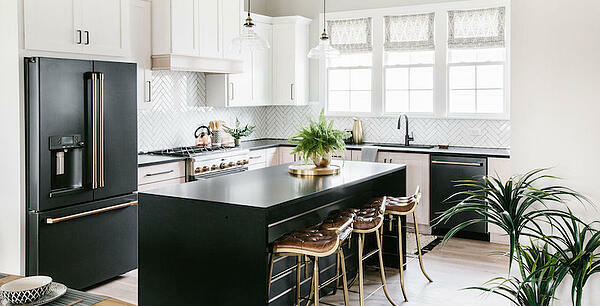 GE's black slate appliances create a whole new look for your kitchen that is soft, elegant and different. They are exceptionally beautiful products and a great alternative to regular stainless or black stainless steel appliances. Once you see them you might just fall in love with the look. Black slate has a long way to go to catch up with the popularity of traditional stainless steel or even black stainless. However, you might want something different than what all of your neighbors, family and friends have. Sometimes being different might be better! Take a look at black slate appliances. They are really a game changing item in the appliance industry. Even if you are not ready to buy yet, you might want to see them in person and experience the look. You may also be interested in the new GE Cafe matte white and matte black collection for an even more customized, unique appliance design!